One of my all-time favorite desserts is this No-Bake Eclair Cake on my blog. It is honestly so easy to make and I always am asked for the recipe wherever I bring it. 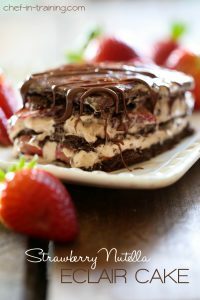 I decided to take this favorite recipe and give it a new and exciting spin… Strawberry, Nutella and Chocolate. Need I say more? These flavors compliment one another perfectly. With the same great texture and idea, this dessert is heavenly. I brought this to a family get together and my mom said she actually prefers this version to the original. So there you have it. You need to make this recipe.. and try the original too and let me know what you think! Just don’t forget to let it refrigerate over night! The longer it sits, the better it gets. The total time to make requires 20 minutes (the number indicated on the recipe) but it wouldn’t let me specify the overnight time. So keep that in mind. An easy and delicious no-bake recipe that will have everyone asking for the recipe! Blend milk and vanilla pudding packets for about 2 minutes. Stir in Nutella until evenly combined. Fold in Cool Whip. Poor half of pudding/Nutella/cool whip mixture on top and level. Arrange half of the sliced strawberries to cover entirely over the pudding mixture. Arrange second half of the sliced strawberries to cover entirely over the pudding mixture. What an incredibly good idea!! What an amazing and easy dessert! I love nutella and strawberries. We have a crepe place that makes a nutella with fresh strawberries with whipped topping. It's AMAZING!! Can't wait to make this recipe!! I have 3 containers of fresh strawberries waiting to be eaten in my fridge. Thanks for the recipe! Looks yummy! Does the graham crackers get soggy if left for a couple of days? I am sending a dessert to auction off desserts and this looks great, and easy to make. Just wondering how well it holds up. Where cam I find the measurements and alternative ingredients for the UK?? I'm from Australia, so I have a similar dilemma. Dr Oetker does a brand of instant/powdered pudding, which I assume would be a viable option. "Cool Whip" is foamy spray-can cream, which is available in Australia (although not terrible popular). I'm thinking about just substituting with fresh, whipped cream! I think, 'graham crackers' are effectively just shredded wheat biscuits, and McVitie's would make a good substitute. In Australia, see if you can get your hands on Cottees Vanilla Pudding. Cool Whip is "non-dairy whipped topping" which behaves differently than real whipped cream. The real stuff tends to separate and get runny. The Cool Whip really is the key to a creamy consistency. Maybe cream cheese could be a sub? Also, graham crackers....I don't know if the McVite's digestives come in chocolate flavor, but that might work. Kind of tragic there are no graham crackers in Australia. What do you use for graham cracker crust?! S'mores? The humanity! Wow, that looks DELICIOUS! I can't wait to make it! Nutella has always been a weakness for me. Did you see my post up above? I'm pretty sure 'graham crackers' are just shredded wheat biscuits (crackers in American parlance are biscuits, and biscuits are scones - the mind baffles!). McVitie's or Arnott's Nice, etc, would probably suffice just fine. As for Cool Whip, it's the fake cream you can buy in spray cans, although I'm pretty sure it'd be fine to just use regular whipped cream. Cool whip is in the frozen section, in a plastic container like margerine, it is not in a spray can and no you can not replace with whipped cream because not same texture and consistancy. As for the pudding, normally made by Jello, it is a small box you have it in different flavors such as butterscotch, banana, chocolate, and vanilla. Thank you so much for sharing, I'm going to try it this week!!! Hi, Rebecca. Check out my reply to Gail's comment up above. You might find it helps to sort things out a bit. Love the sound of these delicious cakes, unfortunately I am in the UK and have not heard of Graham biscuits,Vanilla Instant Pudding mix or cool mix. Can you possibly tell me what would be the equivalent over here. Graham crackers are sweet flat rectangle crackers. You could use shortbread cookies or tea cookies anything that is sweet. Use whipped cream much better taste than cool whip which is a frozen whipped cream made with shortening and other junk. Hi, i noticed you used 1/2 C. Powdered sugar in the basic eclair cake, yet, you used 1 C. In the strawberry Nutella cake, then even double that for topping/glaze. Which should it be, since they are basically the same, save for the berries & Nutella. Thanks! I just changed the other recipe to 1 cup. Sorry about that. I like my frosting a tad thicker than what the 1/2 cup was. Sorry for the confusion! For those using whipped cream (instead of Cool Whip) before you whip the cream add a pinch or two of Knox gelatin. Whip the cream as usual. It will keep the whipped cream from separating for days. You might try McKenzie's gelatin powder as a substitute for the Knox gelatin. Also Graham crackers are not like Shreaded wheat biscuits. Tea cookies or shortbread or almond cookies might be an okay substitute for Graham crackers.. I have been wanting to make this recipe ever since it was posted on your site. My stores didnt have chocolate graham crackers until I saw some boxes at my Wal-Mart and snatched them right up! Now I am SO excited to make them. Yummmm! Thanks a bunch for the creatively delicious recipe! Is there an alternate pudding, crackers and cool whip for those of us in Australia. Would love to try it. You can google recipes for graham crackers. Even if you don't want to make it from scratch, looking at the ingredient list might give you an idea of something suitable you could substitute it with. Definitely not like regular crackers. You can also make pudding from scratch. If you have cream, just whip it with a little sugar and you can use that. Plus it will taste a lot better than cool whip. What can cool whip be replaced with, I'm not sure we have that in Australia, also the Graham choc crackers? I can not find chocolate graham crackers anywhere, what can I use instead? Great recipes, Thank You so much. ok..am a baking noob i'll admit..
when you say "3½ cups whole milk"---> this is the fresh milk we normally drink yes? I made this recipe and it turned out terrible. It tasted great but it never set. Came out like runny pudding. So disappointed. Seemed really easy to make but was actually labor intensive and expensive. What did I do wrong???? Only gave it one star because it tasted good!!!! I made this for my book club last night and it was met with rave reviews! Everyone loved it and wanted the recipe. The only change I made was I did 1 vanilla yogurt and 1 white chocolate. The recipe says she usually doubles the icing recipe, but I couldn't tell if it was already doubled so I followed it as written. It would have been better to have a little more icing as you could see the top layer of graham crackers. Also, I only used one box of chocolate graham crackers, but this was so good, I know exactly what I'll use the other box for!